Jim White is probably best known for his role in The Dirty Three, but is, and has, also the drummer of choice for many leading artists including PJ Harvey, Chan Marshall and most recently helping out Kurt Vile and Courtney Barnett on their Lotta Sea Lice LP of last year. Over the past few years, White’s time has been mainly devoted to Xlyrouis White, his collaboration with Crean lute player George Xlyrouis. 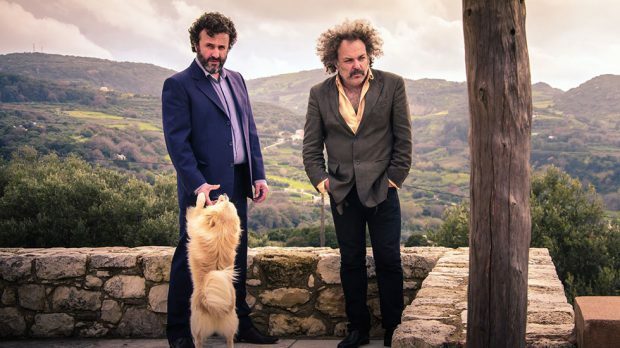 Having just released their third album Mother to acclaim, MICHAEL D HOLLICK got on the phone to Jim White to find out more about Xlyrouis White, what Jim has learned about Cretan music and if the duo will be returning to Perth anytime soon. How would you describe Xlyrouis White? I think the music is very joyful. And in general, I do think this band is very joyful. Sadness is a part of that too. And that’s what I also like about the band. The band is not full of complex systems, it’s not hard to get into. It’s not trippy, it’s very earthy and pretty tangible. I don’t think you need any prior knowledge to enjoy it, I think you can feel the kind of joy in the music without knowing too much. What role does the Cretan influence play in shaping your music? Cretan music is very old but I would also say that it is very modern. It is very lively and in no way is it ‘museum-y’. So I feel that we share that immediacy. And there is an incredible richness and history behind these songs because they are based on Cretan folk music. I think it enhances the emotional aspect of our music. The way I feel with George, musically speaking, is very complimentary and that brings out a new side to me when we play together. I’m from Melbourne, so our history is different and the pathway that this band is on feels like it is premeditated due to where we are from, this mixing of Crete and Australia and both of our histories. How long have you known George? I met George way back, like in the early 1990s in Melbourne. George has been travelling and playing since he was a very young boy due to his Dad who is a well-known Cretan musician and he took George on tour with him. Eventually his travels took him to Melbourne where he ended up staying for while. Around that time, I was playing in a band called 66, that was before The Dirty Three had started. And through sharing stages, or playing festivals, I became aware of him and the Cretan music. Though I had grown up in a Greek area in Melbourne, I didn’t really know much about Greek music. It was through George that I started hearing that music, and in particular the Cretan music, and so I was given a window into that world. I started listening to his music and his Dad’s music. I really loved it. So what compelled you two to finally work together? I felt like we connected when we first met, it has just taken time for us to be free at the same time and then to catch up. And when we did catch up, we started playing music straight away and from that things have happened fairly quickly. When we played our first show in New York, Guy (Picciotto from Fugazi) came to the first show and loved it. The next day we went to his house to record in his home studio, and now he has recorded all three of our albums. To be honest, we even had another album before that first album but we were developing things so quickly that by the time that the album was ready to be released we had already recorded another one. Do you feel that you have a set idea of what you wish to achieve with Xylouris White? No, not really. From the beginning, I could see all these ways that we could go, but as we have gone along, other things have happened, and you still have this idea of all the places you could go, but you’re on the journey now and you’re starting to find your way and what you do is what leads you on. I don’t know what the end goal is, we just wanted to keep going and making records and playing live. I actually really love all the records, and I feel that just as long as you’re doing stuff and you’re playing a lot and recording a lot, you’re always progressing. And is that the same sort of idea you had when recording for Mother? Pretty much. We didn’t sit down and carve out an exact script to perform. We recorded a bunch of sessions for a record. And we sort of record a lot and with a two-piece band it is very flexible and it is very mobile so we’re always thinking of what we’re doing. There was no rush to get here (three albums released within five years), but we’re excited to get here. The joy is in the journey. One of the stand out tracks from the record for me was the very improv-sounding Call and Response. How did that come about? That really just happened like that. We hit this moment that was just kind of supernatural, it’s quite short and it’s a moment that just happened and it was composed very spontaneously. We play very naturally together, we have a good rapport and we can use a nod or a glance to signify changes so we can work the music out as we go along. And of course, a lot of listening, aware listening. Are you touring this record and do you think you will make it to Perth? We start touring in a month and we will come to Australia in the middle of the year, June is the plan. I hope we come to Perth. There has been talk. We played (last year) with PJ Harvey at the Fremantle Arts Centre, and Lucky Oceans has been trying to get us to come down there, he’s great, and I don’t know if it’s certain but I would definitely love to.